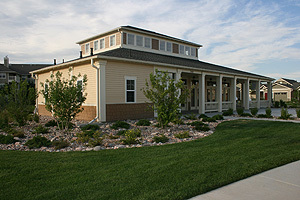 22 senior independent patio homes plus a community gathering space common to the entire campus are included. Units vary from 1-bedroom/den to two-story 3 bedroom/den, and vary in size from 1,450 s.f. to 2,118 s.f. 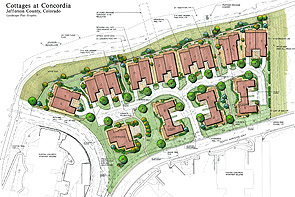 The site sits directly adjacent to a recreational lake with unobstructed views to the waterfront, and ties the two existing Concordia apartment buildings together. The central commons building is sited to be the front door to the campus as one approaches by vehicle. A large corner porch provides connection from the commons building to the lake and gardens. A row of units front the lake, with the two-story “E” units book-ending the site. Two common paths lined with gardens connects all on campus to the lake and new commons building. Units further from the lake front greenways. 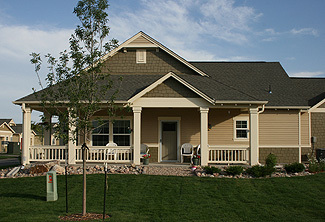 All units have ample front porches and private backyards. All units were carefully designed for aging in-place.